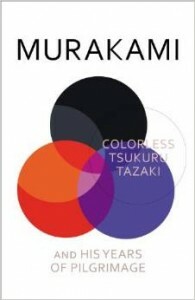 These days Haruki Murakami is so well known that his book jackets simply say “Murakami”. Which is a bit weird, as there’s another author Murakami – Ryu – who, while not as quite popular, is certainly not unknown, with works like Coin Locker Babies and Audition – which was made into a film – in his catalogue. In fact, our household is divided down the middle. When I say “Murakami”, I mean Haruki, while when my partner says “Murakami”, she means Ryu. Nevertheless, a new Murakami, H., book is a publishing event. Foyles in London had a midnight opening for Colorless Tsukuru Tazaki and His Years of Pilgrimage. Living in Leicester, that’s not something I could take part in, but since 1Q84 I’ve been buying Murakami in ebook format anyway, so my copy was automagically delivered to my Kindle overnight. I think it’s fair to say that if you like Murakami, you won’t be disappointed. If you’ve never been a fan, this book won’t convince you otherwise. It’s full of traditional Murkami touches, although the parallel worlds have been toned down (although, it seems, not removed altogether) and there are no cats at all. No scenes of spaghetti-cooking, either. But still, it’s unmistakably Murakami. Where 1Q84 had Janáček’s Sinfonietta as its musical theme, Colorless Tsukuru Tazaki and His Years of Pilgrimage has Liszt’s “Le mal du pays” from his Years of Pilgrimage suite. Tsukuru Tazaki is a recognisable Murakami protagonist, too. He is a man alone and lonely, neither young nor old, who is scarred by an event when he was young. He was part of a close-knit group of five people, three boys and two girls, who were inseparable until suddenly they all told him, without explanation, that they never wanted to see him again. This event, this betrayal, this sudden and catastrophic desertion, defines the emotional journey of the rest of his life. All four of his friends have surnames that include a colour in their name – Akamatsu, red pine; Oumi, blue sea; Shirane, white root; and Kurono, black field. Only Tsukuru Tazaki has a surname that doesn’t have a colour in it; it becomes a joke amongst them – Colourless Tsukuru Tazaki. But it’s a joke that serves to separate him from his friends, even if just a fraction. Even in the close-knit group, he’s an outsider. So when he’s cast out from the group, he accepts it. By the time of the events of the book, he’s in his 30s. It’s been sixteen years since he was deserted by his friends, and he’s had difficulty forming any lasting relationships. He’s prompted by a new relationship with a woman called Sara to go back to his home town and find out just why his friends deserted him. For me, it’s a book about the differences between our perception of ourselves and the way other people perceive us. Even in the close-knit group of friends, Tsukuru Tazaki’s perception of himself was completely different to the way his friends perceived him. Neither viewpoint is ever entirely correct, though. Even though we live inside our own heads, we’re often completely clueless about our own characters, our strengths and weaknesses. While other people don’t have that privileged inside view, they at least have the benefit of an external perspective. The truth is often somewhere in between. Colorless Tsukuru Tazaki and His Years of Pilgrimage ends without resolution, with questions unanswered, such as what exactly happened to Shiro, or what will happen with Tsukuru Tazaki’s relationship with Sara. But nevertheless it’s a satisfying conclusion that leaves you thinking about the book long after you’ve turned the last page.